Size: 375 x 495 mm. From the atlas 'Typus Orbis Terrarum'. 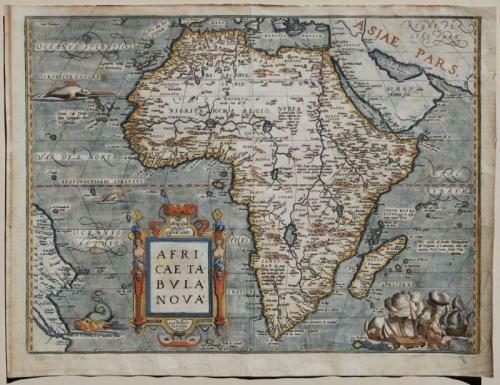 A striking continental map designed by Ortelius from elements of contemporary maps by Gastaldi, Mercator, and Forlani. It is considered a cornerstone map for African collections. The name Carneca appears for the first time, and Zanzibar is shown on the west coast. The Nile is based on the Ptolemaic concept. The map is decorated with a strapwork title cartouche, a grand sea battle, swordfish and a whale. There is no sign of the so-called ghost-like sea monster off the coast of Arabia. There has been a repair of a split corner and there are a couple of small repaired tears to the margin that do not affect the image area. .
Ref: Broecke 8, Norwich Maps of Africa 10.